Whenever a new government is elected, as happened in Ontario last year, one of the most important questions is whether it will maintain the policy trajectory of its predecessor or instead chart a different policy course. With the Ford government’s first budget next week, we will soon know more about whether this government will deliver the type of comprehensive policy reform Ontario sorely needs. Ontario’s economic performance has been weak throughout the past decade. In fact, inflation adjusted per-person economic growth in the province has been so weak that a Fraser Institute study characterized the period from 2007 to 2017 as a “lost economic decade” for Ontario. While the provincial-level stats are hardly impressive, things are even worse if you look what’s been happening outside Toronto and Ottawa. In the rest of the province, there has been virtually no net job-creation over the past decade. Of course, some claim that Ontario’s economic weakness is an inevitable result of global economic restructuring and the movement of manufacturing to developing countries. In this telling, any jurisdiction with Ontario’s characteristics would have struggled similarly in recent years. But a glance across the border at manufacturing-intensive Michigan shows that economic stagnation has not been an inevitable outcome for manufacturing jurisdictions in Canada and the United States. A 2016 study showed that in the years following the 2008/09 recession, Michigan’s economic recovery was generally stronger than Ontario’s (although the recession itself was steeper). From 2011 to 2014, for example, inflation-adjusted economic growth per person in Michigan averaged 1.7 per cent annually—about double the 0.9 per cent growth rate in Ontario. The divergent performance of the two jurisdiction’s manufacturing sectors was particularly stark. During these years employment in Michigan’s sector grew at an average annual rate of 6.1 per cent. In Ontario, it went the other way, declining at an average annual rate of 0.5 per cent. The two manufacturing sectors and broader economies clearly followed very different trajectories. Clearly, Michigan’s remarkable turnaround should be of interest for Ontarians because it happened at the same time the Michigan government implemented a series of economic reforms. These reforms included comprehensive business tax reform, the implementation of a “right to work” law that made it illegal to require workers to pay union dues as a condition of employment, and a more prudent approach to fiscal management. Indeed, the state enacted sharp budget cuts in 2012 and allowed only modest growth in subsequent state spending. This final dimension of the reform package produced a string of balanced budgets and helped build Michigan’s “budget stabilization fund.” Again, this approach (and its results) contrasts sharply with Ontario. While it’s hard to know exactly how much of Michigan’s turnaround can be attributed to policy change and how much of it would have happened anyway, Michigan’s example undermines the narrative that manufacturing jurisdictions in Canada and the U.S. have been doomed by forces outside their control. What’s more, Michigan provides an example of a government that has fundamentally rejected the policy direction of its predecessors, implemented comprehensive reform, and experienced positive economic outcomes for its residents. 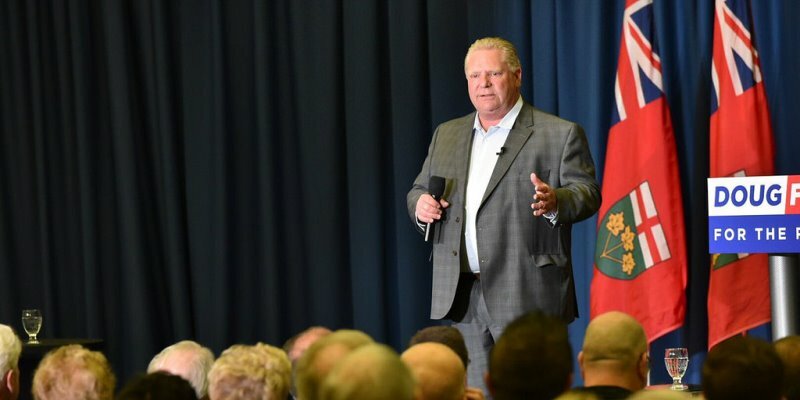 If the Ford government wants a shot at Michigan-style success, it should look carefully at the state’s policy reforms before it tables next week’s provincial budget.